References to a new AMD APU, the Ryzen 7 3700U, have been spotted online leading to speculation as to whether this could be a Zen+ or a Zen 2 part. 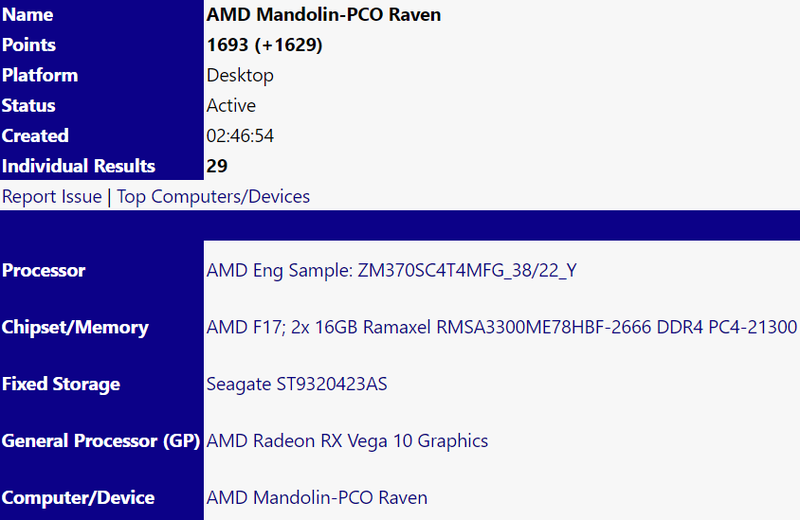 The Ryzen 7 3700U sports the same clocks and core counts as the Ryzen 7 2700U and most of the evidence so far suggests that this could be the Zen+ APU as the previous 2000U series were based on Zen. A leaked AMD CPU of the ultra-low power APU variety has surfaced on Userbenchmark. The entry points to a CPU codenamed ZM370SC4T4MFG_38/22_Y indicating that this could be the Ryzen 7 3700U APU. From the codename, we can infer that the base clock of this CPU is about 2.2 GHz while the boost is 3.8 GHz in a 4 core 8 thread configuration — in other words, the same as the Ryzen 7 2700U. This begets the question — is the Ryzen 7 3700U a Zen+ or a Zen 2 part? The interesting part is the GPU section where the graphics card is being shown as AMD Radeon Picasso graphics. Earlier this year, we detailed a report by Informatica Cero, which outlined a leaked roadmap for AMD CPUs and APUs till 2020. According to that roadmap, Picasso is supposed to be a part of the Inflection cycle, which means that it is a Zen 2 part to be launched sometime in 2019. Interestingly, other benchmark tools such as SiSoftware seem to recognize this very GPU as a Radeon RX Vega 10. So, is Picasso just a rebrand of the current Vega 10 (Mobile)? We do not know. On the contrary, we've seen benchmarks of Picasso earlier as well and speculated that this could actually be a Zen+ part and not Zen 2. There are strong reasons in favor of this argument. The present 2000U line of APUs came months after the launch of the Ryzen 1000 series but still ahead of the Ryzen 2000 series of desktop CPUs and thus, was based on the Zen architecture. A similar pattern could be followed this time as well. The Ryzen 3000U APUs could launch much ahead of Ryzen 3000 CPUs and thus, will be based on 12 nm Zen+. Also, since Zen 2 is a 7 nm part, we can expect a higher core count CCX, which does not seem to be the case here. It could be that AMD prefers maintaining the current gap between APUs and CPUs. A roadmap that was leaked by Informatica Cero last year mentioned that Picasso will be based on the Raven Ridge architecture and can in fact, be considered as Raven Ridge second generation, which implies Zen+. The ultrabook and multimedia notebook segment is still dominated by Intel's offerings despite AMD putting up a great show performance-wise. A 7 nm Zen 2 APU could turn the tides in favor of AMD as Intel is expected to hold on to 14 nm for the greater part of 2019. Zen 2 or not, we hope that Ryzen 3000U series will finally see a wider adoption of AMD APUs in notebooks across OEMs and price segments. The Zen 2 architecture is an Inflection point in AMD's Zen roadmap and will be the beginning of AMD's transition into the 7 nm process. The first mainstream Zen 2 CPUs will be officially showcased during CES 2019.